Arran is an island off the west coast from Ayrshire and is often referred to as Scotland in miniature. In the south of Arran you can find fertile valleys, meadows and prehistoric ruins. The north of Arran is very different, tall mountains and deep valleys where deer rule, combined with very picturesque villages in the North and East on the beautiful shores of the Firth of Clyde. 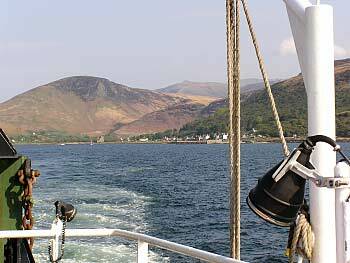 Arran can be reached by ferry from Ardrossan on the mainland to Brodick or from Kintyre, the Claonaig to Lochranza Ferry. Lochranza is the ferry terminal for the Claonaig ferry and Lochranza is home of Lochranza Castle which is situated on a promontory in the middle of Loch Ranza. The original building dates to the 13th century when it was owned by the MacSweens. In 1262, King Alexander III granted the castle and its lands to Walter Stewart, the Earl of Menteith. It is believed that Robert the Bruce landed at Lochranza in 1306 on his return form Ireland to claim the Scottish throne. By 1371, the castle has become the property of Robert II. During the 1490s, James IV used the castle in his campaign against the Macdonalds, the Lord of the Isles. In 1614 it was occupied by James VI and in the 1650s it was used by Cromwell. 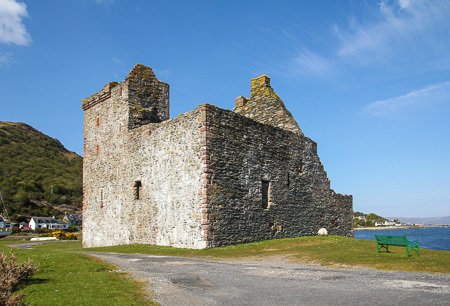 By 1705, Lochranza Castle had become the property of the Hamilton family who owned other estates on the Isle of Arran. During the 18th century, the castle fell into disuse and disrepair. When you follow the A841 towards Brodick you first pass the Isle of Arran Distillers Ltd. on the right. Arran Single Malt is a Single Malt Scotch whisky distilled by the Arran Distillery, the only distillery on the Isle of Arran. Arran Distillery was founded in 1995 and is the first legal distillery built on the Isle of Arran in over 150 years. The water for the malt is from Loch na Davie. The distillery of the Isle of Arran was founded by Harold Currie, former director of Chivas. The spirit produced in the distillery has officially been called “whisky” since the summer of 1998. To celebrate this event, a limited bottling has been released, to restore an ancient tradition. There used to be about fifty distilleries on the island, but most of them were “moonlight” or illegal distilleries. Brodick is the main village on the Isle of Arran, with tourism providing much of the village’s economic base. Brodick’s population was 621 in the 2001 Census. It is set on the eastern coast of the island, roughly in the central section. It sits below Goat Fell, the tallest mountain on Arran, and in Brodick Bay. The name is derived from Norse roots meaning “Broad Bay”. Renting boats, mini golf, bike hire, fishing, bowling, supermarkets and other shops can be found here. A trip to Holy Island is possible from Brodick (only in the season). The Paddle Steamer Waverley occasionally visits Brodick. Brodick Castle is located near the village of Brodick and is one of the finest castles in Scotland. A fortress has been on the site since the fifth century, being destroyed or demolished and rebuilt several times. The present castle originates from 1588. Oliver Cromwell occupied the castle briefly and added some extensions. The Hamilton family acquired the castle shortly after. A picture of the castle appears on the back of twenty pound notes issued by the Royal Bank of Scotland. The Hamiltons made some major changes to the castle and became what it is today. Remarkable fact are the almost 90 heads of deer that were brought to the castle as a hunting trophy and can be found on the wall along the main stairs. In 1957, the Duchess of Montrose (daughter of the 12th Duke of Hamilton) gifted the castle to the nation, in order to avoid substantial inheritance tax liabilities on her death. The castle is now owned by the National Trust of Scotland. The castle is open to the public, as are the grounds. It is also home to the art collection of 18th century author William Beckford of Fonthill whose daughter married the 10th Duke of Hamilton. One of the rooms is known as ‘Bruce’s Room’ but since the castle was all but destroyed in 1455 and 1544, it is unlikely that Robert the Bruce actually stayed in it. The gardens of Brodick Castle are very nice laid out and should be included in a visit to the castle. The castle is open daily from April to October 11am – 4.30pm. The Country Park is open all year round every day from 9.30am until sunset. Telephone: +44 1770 302202 / Fax: +44 1770 302312. There’s a licensed restaurant with outside terrace and souvenir shop. Goat Fell is the highest point on the Isle of Arran. At 874 metres (2867 ft), it is one of four Corbett’s on the island. The mountain, along with nearby Brodick Castle, is now owned by the National Trust for Scotland. Due to the popularity of Arran, Goat Fell is a very popular peak and there are many possible routes of ascent, some of which may be combined with visits to the summits of other nearby peaks. The most commonly used route, a constructed path of just under 5 km in length, starts from near Brodick Castle in Cladach. Initially the path leads up through the forested grounds of the castle, passing many rhododendron bushes. Above 300 m above sea level the path leaves the forestry, and the route continues through bare moor land, reaching the summit by way of the east ridge of the mountain. There is a viewpoint table at the summit: on a clear day Ireland may be seen. Holy Island is located in the Firth of Clyde off the west coast of central Scotland, inside Lamlash Bay. The island is around 3 kilometre (2 miles) long and around 1 km (around half a mile) wide. Its highest point is the hill Mullach Mor. The island has a long history as sacred site, with a spring said to have healing properties, the hermit cave of 6th Century monk Saint Molaise, and evidence of a 13th Century monastery. A trip around Arran is about 90 kilometres and can be done in 4 hours, depending of course on the amount of stops and a visit to Brodick Castle which is a must if you ask me. The castle and gardens are stunning and the view over Brodick Bay is phenomenal. For most travellers Lochranza or Brodick will be the start of the tour. I will start from Lochranza. Lochranza is a beautiful and very quiet little town on the north-west coast of Arran. On the A841 direction Brodick are the Arran Distillers Ltd. From the distillery the road winds its way up in Glen Chalmadale and drops again before the little villages of Mid Sannox and Corrie, tiny but very well maintained with ever changing views of the Firth of Clyde. Sannox is the location of a nine hole golf course. Corrie lies under the island’s highest mountain, Goatfell, and a path provides access to the hillside. From Corrie the road continues towards Brodick where Brodick Castle is located. Brodick is the main town/village on Arran and has shops and local services. From Brodick the road continues to Margnaheglish which is situated on the beautiful Lamlash Bay. Here Holy Island is clearly visible and a little detour to Clauchlands Point is recommended. Continuing from Lamlash Bay you enter the South part of Arran where places like Knockenkelly and Kiskadale are located near Whiting Bay. The road now continues passing Kildonan Castle and past Bennan Head, the most Southerly tip of Arran. The name Kildonan derives from Saint Donan who is reputedly buried in the village. Early life in the village revolved around Kildonan Castle (sometimes referred to as Kildonan Tower). 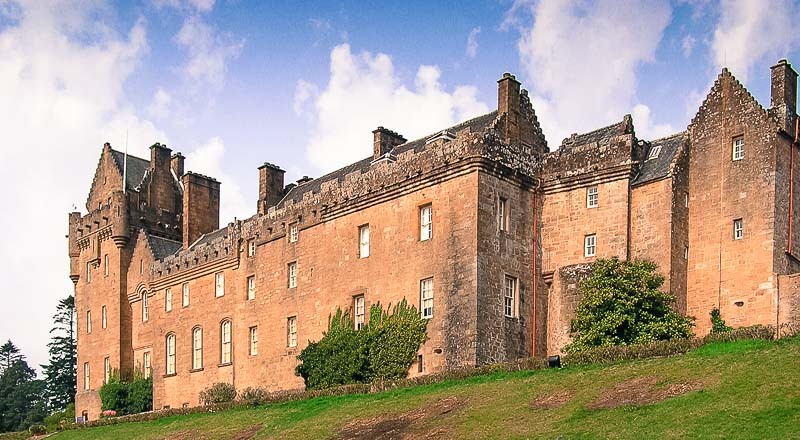 Once a royal seat, the castle passed hands between various Scottish nobles, before latterly belonging to the Hamilton family in 1544, by which time they were the Earls of Arran. The Tower was later sacked and burnt by the Earl of Sussex around 1558. Ruined remains of the building are still in existence. Close to Lagg and Corriecravie are chambered cairns, Mesolithic monuments from thousands of years ago. The A841 now turns North towards Blackwaterfoot and Tormore. 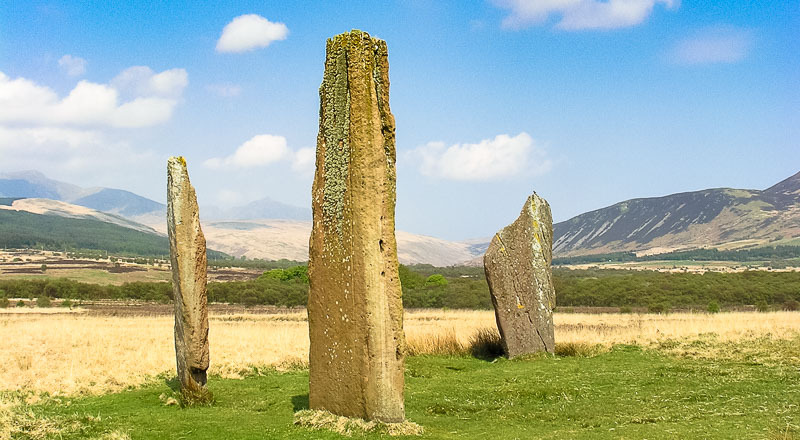 Tormore is located on the East coast and can be used as a starting point for a walk on the Machrie Moor, a relatively flat moor land and the home of several Standing Stones and Stone Circles. Impressive monuments against the backdrop of Beinn Tarsuinn and Goat Fell, with 874 meters the tallest mountain on Arran and the most easy one to climb, even for non experienced walkers. From the Machrie Moors the B880, or string road, takes you back to Brodick crossing the island from South West to north East. A beautiful drive passing An Tunna and great views of the Goat Fell when weather permits. Arran is a little paradise like island that has a lot to offer. Beautiful beaches, picturesque villages, impressive mountain ranges and lots of interesting history.